Shadowmere is Lucien Lachance's black horse. She is given as a reward for completing the Dark Brotherhood quest The Purification. She is one of the fastest horses in the game, as well as having a moderate attack, decent enough to aid in fighting multiple opponents. Shadowmere is also an essential character, meaning that she cannot die, only become unconscious. Also, the armored versions of Shadowmere do not have the HorsePCFarragutGoHome AI package, and therefore she will not return to Fort Farragut if she wanders off. You can use the console to move your character to Shadowmere's location: player.moveto 00032BF5 (for the unarmored version; for the armored version use the appropriate RefID provided above). If Shadowmere is knocked unconscious, and you have not armored her, when she recovers she will always start to wander back to Fort Farragut (which may take a very long time) unless you remount her. From the console, you can effectively remove Shadowmere's armor by disabling the armored version (click on Shadowmere in the console, then type disable), then enabling the original unarmored version using the commands prid 00032BF5 and then enable. As Shadowmere is an essential creature, it is possible to knock her unconscious then store items on her body as if she were a chest. When she regains consciousness you can ride her again. This is a useful way to carry items around on a horse without a third party mod. However, attacking Shadowmere can cause some bugs unless you have the latest patches installed; and you will have to go to Fort Farragut to retrieve her if you forget to remount her afterwards. If you're using Shadowmere for storage, and you have the Horse Armor Pack plug-in installed, you should remember to remove all of your valuables from Shadowmere before equipping her with armor (or altering her type of armor). The armored versions of Shadowmere are each technically a different horse, and you will lose all your stuff if you don't remove it from her first. 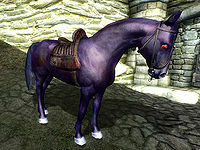 If you are on the PC, you can enable the original Shadowmere using the enable command (see previous note for details). Be careful about storing potions inside Shadowmere. When in battle, Shadowmere's AI will attempt to make use of any useful items in her inventory, which means that she may drink any potions. You can use this to your advantage and give Shadowmere potions with beneficial effects. Shadowmere is not included in the "Horses Owned" statistic on the stats page in game, since she is technically on loan to you. Shadowmere can be used to effectively train various combat skills, since she will never die and will never become hostile after you attack her. However, there are several possible glitches associated with this, as detailed in the linked training article. Shadowmere reappears in Skyrim as a male. Esta página foi modificada pela última vez à(s) 06h38min de 14 de outubro de 2013.